Video Editing, is an interesting career for creative people in the media and entertainment industry. The entire process of making art, aesthetic in the visual media, lies in the technique of editing. Video editing is the process of re-arranging or modifying segments of video from one or more video tapes to form a refined and final piece of video. 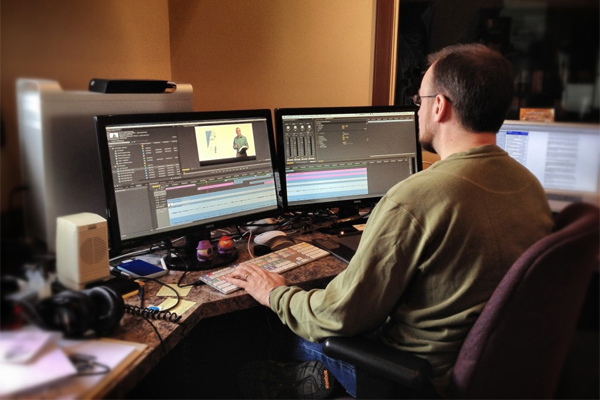 Video editing plays a key role in the post production process. The main task of the video editor is to edit soundtracks, film and video for the motion picture, cable and broadcast visual media industries. It is the video editors skill that determines the quality and delivery of the final product. Video Editing is classified as Linear Editing (Tape to tape), and Non-linear editing or Digital Video Editing. Digital video editing uses computer technology to enable the editing process onscreen. Linear editing involves copying just the required portions of a film from one tape to another. Any changes or additions needed could be made only by copying the edited content onto another tape, causing undesirable degradation of images. In Non- linear editing, video and audio data are first captured to hard disks or any other digital storage device and then edited on the computer using any of the wide range of software's available for editing. Here data can be edited and subsequent changes made without duplicating the actual film data. It is quicker, less expensive, more flexible and saves time and money when compared to the traditional way of editing. Due to all these features and the introduction of new technologies in digital video editing, it is fast replacing the traditional or linear editing. Video editors are in great demand with the advent of streaming videos and movie clips in websites. As this field is becoming highly competitive, video editors can expect keen competition for job openings. The increased popularity of online video clips has also produced a large increase in video editing activity by internet users.